Home › News › 10 days left to reach our Crowdfunder stretch target! As you are probably aware, we have been running a Crowdfunder campaign since Oct 2018. Thanks to your support we reached our initial target of £30,000. This enabled us to cover the basic costs of our move to the Sojourner Truth Centre. Thank you so much! Once again the Feminist Library was saved by the hard work of its volunteers and the support of the community. We decided to extend the Crowdfunder, and create a stretch target which would cover all the costs of refitting our new home. Now we have only 10 days left to reach this goal and we are asking for your support one more time. Please do consider donating if you haven’t already: Donate now. 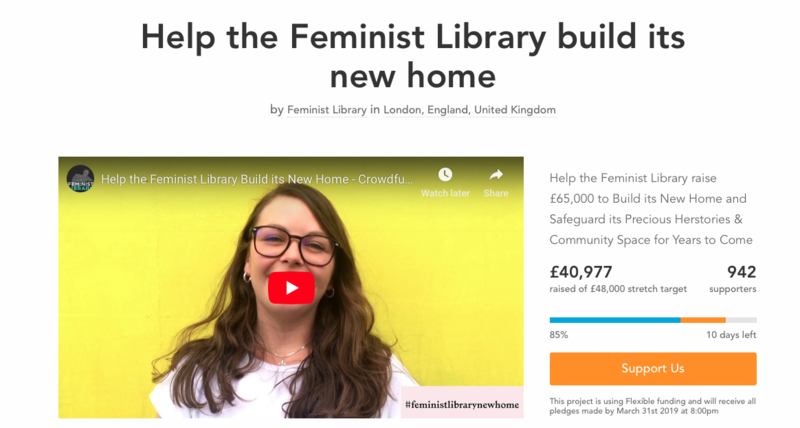 Achieving this goal would enable us to relax with the knowledge that the full costs are taken care of, and the Feminist Library is secure. If you have already donated but would like to support the Library on a longer-term basis, please consider becoming a Friend. Thank you so much for all your support so far, we’re so incredibly grateful for all the love we have received from so many people.